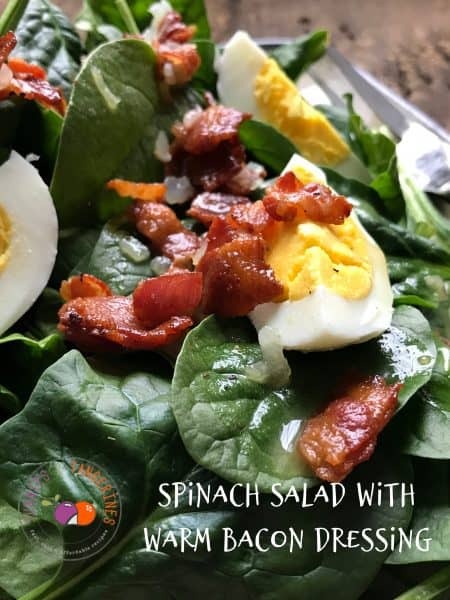 Spinach salad with warm bacon dressing is something that I usually order when I go out to eat but very seldom ever make at home. After I made this recipe, I couldn’t believe how easy it was to make. Nor could I figure out why I haven’t made this at home more often. 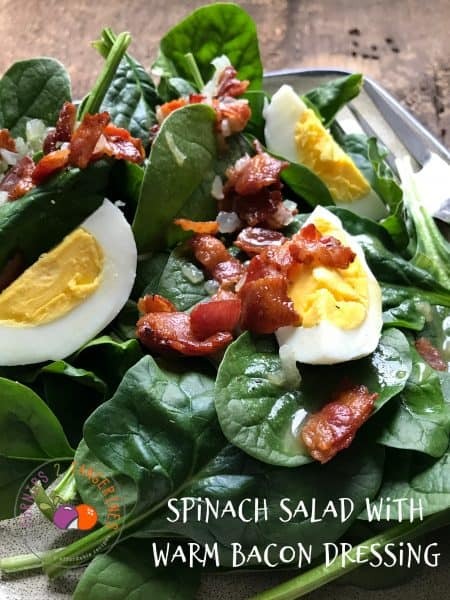 Spinach salad with warm bacon dressing is most often seen on Supper Club menus here in Wisconsin but I definitely think its time to start making this salad at home. 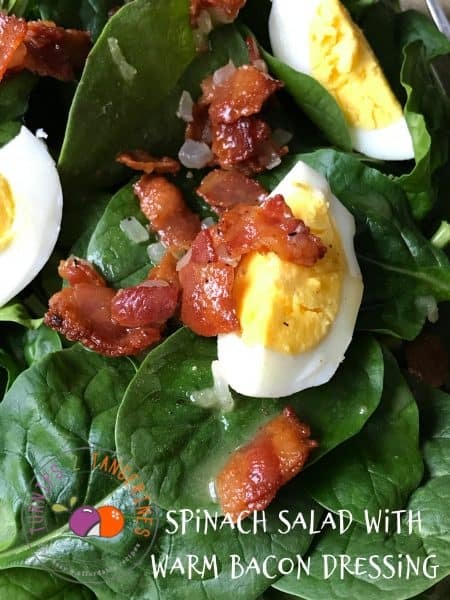 Most spinach salads with bacon dressing that I’m familiar with, don’t require any other ingredients except spinach and bacon dressing. 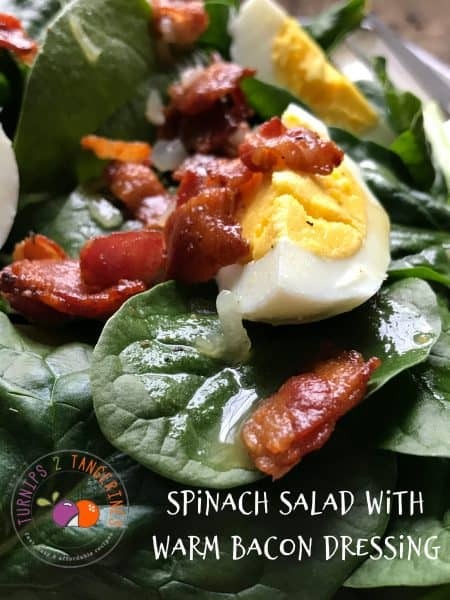 I do believe that this type of spinach salad was or is called: “wilted spinach salad.” The fresh spinach leaves are “wilted” by the hot bacon dressing. Spinach salad has evolved over the years with the addition of ingredients such as eggs, mushrooms, onions, and radishes. Either way its made, this salad is good! If your family is anything like mine, they’ll come-a-running when they smell bacon frying. The dogs and hubby start to circle round the kitchen. At my house we like bacon on everything, so this recipe was an easy sell. 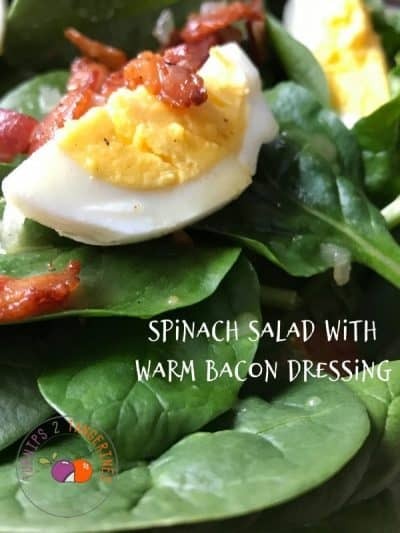 Even though the spinach salad ingredients have changed somewhat, the bacon dressing has remained the same. This dressing is basically a bacon sweet/sour dressing. Everything this dressing is poured on, is all the better for it. The first time I had this salad was many years ago at a Supper Club called George’s Steakhouse . I was out to eat with my then husband and his family, my then in-laws. Let’s just say that spending time with my then in-laws was well, entertaining and unpredictable. You never knew what was going to happen, that’s the unpredictable part and the entertaining part depended on how much alcohol was consumed. This particular evening, started out as usual. It went something like this: Everyone meets at the Supper Club, we all tumble in the door and give our coats to the hat-check girl. We tell our husbands what drink to order and the ladies proceed, single-file, to the ladies room. After a quick look in the mirror, we slowly weave our way through the crowd back to the bar, climb up on a bar stool, light a cigarette and proceeded to get drunk. About 2 hours, 4 drinks and 1/2 a pack of cigarettes later, our waitress showed up to tell us our table was ready. On this evening it was my then mother-in-laws birthday, which meant things might be even more unpredictable than usual. First of all, George’s Steak House had a piano bar, which wasn’t their fault. They had no idea that my then mother-in-law loved to sing. Nor would they have known that once she sat down at the piano bar, she won’t be getting up anytime soon. But we all knew what was ahead, the calm before the storm you might say. The rest of us decided to finally sit down at our table, that had been reserved for 3 hours and look at the menu. During this time, my then mother-in-law is still at the piano bar, singing. The poor waitress came back to take our orders, we tell her to give us about 15 more minutes. And 15 more minutes and 15 more. Finally, after an hour we decided to order, with or without the mother-in-law. It’s now almost 9:00 pm. We’re all hungry, drunk and our poor waitress has had it. After finally ordering our entrees, we waited for our soup and salads to arrive. By this time, the Supper Club was staring to clear out. It was getting late and ‘rush hour’ was well over. That meant we could now hear singing coming from the bar area. 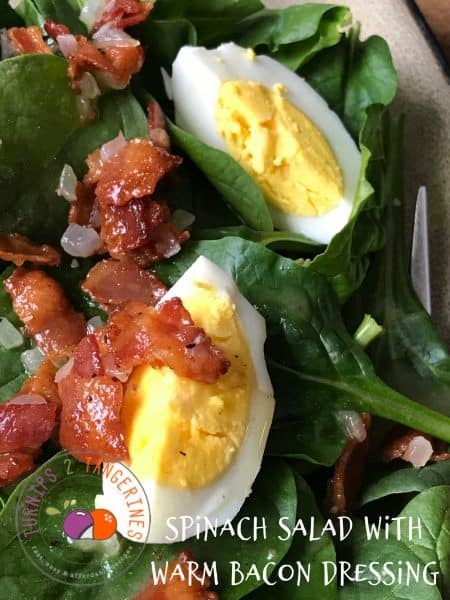 As I preceded to take my very first bite of spinach salad with warm bacon dressing, I could hear my then mother-in-law singing “Oh Danny Boy” My salad was absolutely delicious. Spinach salad with bacon dressing was the only thing I ate that night. Before the entrees arrived, our depleted waitress came to the table and announced that she was very sorry but someone needed to take my then mother-in-law home. Apparently she had tried to get up from the piano bar, (where she had been sitting for close to 4 hours) and had to sit back down. It was unclear but it seemed she was too drunk to walk. Lynn and I quickly volunteered to drive our mother-in-law home. The main purpose for our ‘good deed’ was a selfish one at that. It was our way of saying “Let’s get the hell outta here!” This might explain why every time I order spinach salad with bacon dressing I think of that night. It was the first but not the last time I enjoyed this delicious salad. Some memories never fade but one thing is for certain, this salad will never fade away. Many Supper Clubs serve spinach salad with warm bacon dressing topped with homemade croutons. This step is optional but in my humble, culinary opinion the addition of homemade croutons is genius. I mean, who doesn’t like homemade croutons?!? I put them on everything! I would take a bath in them if I could. I’m even going to write a post in the very near future on homemade croutons. Even though the incident I was referring too earlier in this post took place some 35 years ago, George’s Steakhouse is still going strong and serving delicious food in the Appleton WI area. Located in the same building on Memorial Dr., this restaurant is an Appleton area landmark. When a restaurant has been in business for as long as George’s Steakhouse has, since the 1930’s, the food has to be good and it is! Make the dressing: in a large bowl, whisk together the vinegar, honey, mustard, salt, and pepper. Set aside. Transfer the bacon fat to a heat-proof bowl. Measure 4 tablespoons of bacon fat, return 4 tablespoons bacon fat to the skillet. Add the shallots to the skillet and cook over low heat, stirring frequently, until softened, 1 to 2 minutes. Looking for more spinach recipes? We got you covered. Bacon, Spinach, Cheese and Potato Bake, White Bean Spinach Soup, Knorr Spinach Dip and Goat Cheese, Spinach and Black Forest Panini. Eating spinach never tasted so good. Popeye knew what he was talking about! Apple Cider Vinegar used in this recipe is Bragg Organic Raw Apple Cider Vinegar. 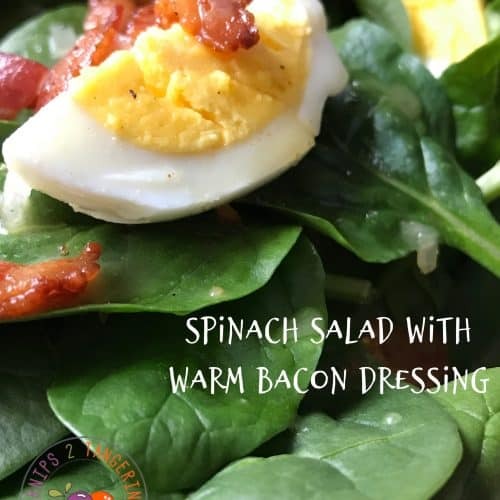 I’ve always loved spinach salad with warm bacon dressing. In fact, my favorite salad at Applebees is basically this – with grilled shrimp added. I definitely need to make this at home.